Taking the versatility of the M1 Carbine to the next level, the new UltiMAK model M6 mount is the lowest, most stable and practical optic mount available. The forward positioning allows faster targeting with better field of view, provides more rail length, maintains full access to the receiver mechanism with optics in place, and will not interfere with case ejection. No need to remove your rear iron sight. Use of Q.D. type scope rings (Aimpoint 12243 shown, bottom left) allows you to revert to full functionality of iron sights while your UltiMAK M6 mount remains in place. The MIL STD 1913 (Weaver/Picatinny) rail sits lower than anything else available for this great rifle, providing a better, more natural spot weld for extremely fast target acquisition. 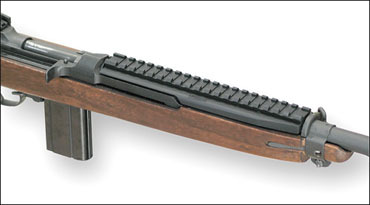 No-gunsmithing installation (some stocks require minor inletting of wood inside the forend, while the old G.I. stocks we've tested require no modification). CNC machined from super strong 6061-T6 Mil Spec hard anodized aluminum. Notes on compatibility; The UltiMAK M6 optic mounts are designed for MIL SPEC carbines ONLY. 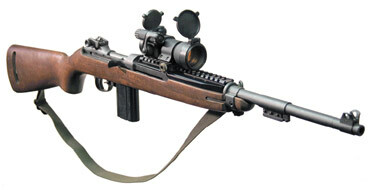 They will not fit, and cannot reasonably be modified to fit, most commercially produced Carbines such as Universal, Plainfield, Iver Johnson, etc., etc, nor will they fit the new Inland Manufacturing Carbines (not to be confused with GM Inland Division, which produced MIL SPEC Carbines during W.W. II - our M6-B fits those of course). If you have a commercial or other non-MIL SPEC Carbine and you want to enjoy the benefits of the M6 forward optic mount, it is advised that you trade it for a G.I. blueprint carbine. Either a 1940's vintage or the more recent production IAI, IMI, or a new Auto Ordnance Carbine will likely perform better, and will be compatible with all after-market parts, stocks and accessories. Some of the very early production commercial Carbines from circa the 1960s do have MIL SPEC parts, and so it is up to the user to determine which parts set one has before ordering a mount for ANY commercially produced Carbine. We will of course take returns for refund if a mount ordered from us simply does not fit, so your only risk is the small shipping charge and a little bit of your time. To summarize; MIL SPEC Carbine? We have a mount for it. Non-MIL SPEC Carbine? We do not have a mount for it. The UltiMAK M6 when installed, should touch nothing but the barrel (should not touch the barrel-band or the receiver)(see photo; bottom right). We now offer two models, as some of the Auto Ordnance Carbines require a shorter mount. If you have a vintage Carbine, an IAI, or an IMI Carbine, you'll want the M6-B. Since the length of the mount is partly determined by the stock and the barrel-band clip, you may still want the M6-B if you're using an after-market stock on your Auto Ordnance Carbine. Simply measure the distance between the barrel band and reveiver, and get the model that's closest to, but still less than, this measurement. If you find your new optic mount too long or much too short, we will be glad to exchange it for the other length. Clamps securely to barrel in front of gas block. Comes complete with screws, 4140 steel clamps, wrench and easy instructions. Finish: Hard anidized, non-reflective black matte. Same as M6-B, but shorter in length.